In this part of the review, I will cover all of the external and internal details of the LWRC M6A2 rifle. Keep in mind that this rifle is approximately 4 months old and you may see some dings or wear in the photos. Also, since I have taken the photos at different times, the lighting was not the same throughout and this may give the appearance of a darker or lighter finish. Since it is a black rifle, the darker photos are a closer match to the actual finish of the rifle as shown in the photo below. The upper and lower receivers are machined out of forged 7075 T6 aluminum which is typical for many AR style rifles. Next, the receivers are Type III Hardcoat Anodized per MIL-A-8625. Hardcoat anodizing forms a thick (.001" to .003") aluminum oxide coating. This layer becomes an integral part of the metal. For example, a .002" coating will add .001" above the surface and will penetrate .001" into the metal, resulting in an extremely hard inert coating that significantly enhances the hardness and durability of aluminum. Lastly the receivers are dry-film lubed on the interior per MIL-PRF-46147C. Overall I was impressed with the external finish and appearance of the receivers. I did a check of the upper to lower receiver fit and found that when I pushed all the slop to one direction I measured 0.011" of clearance on the other side of the receivers. I have made this same measurement on other rifles and have measured as low as 0.006", so I was not overly impressed with the matching of these two receivers. Honeslty I don't know what is a mil-spec maximum, but my impression was that 0.011" is more than it should be. The lower receiver assembly contains the trigger assembly, safety selector, bolt release, magazine release, and take down pins. One thing worth noting is LWRC's designation for safe, fire and fully auto that is embedded on each side of the lower receiver. Even though this review rifle is not setup for fully auto, the infinity sign (fully auto symbol) is kind of cool. Some of the key components of the upper receiver assembly are the charging handle, integrated upper rail, forward assist, ejection port cover assembly, and shell deflector. You can see that some casings hit the shell deflector during past use. In this photo, the silver mark on the upper receiver is made by the bolt release lever when it contacts the upper receiver. 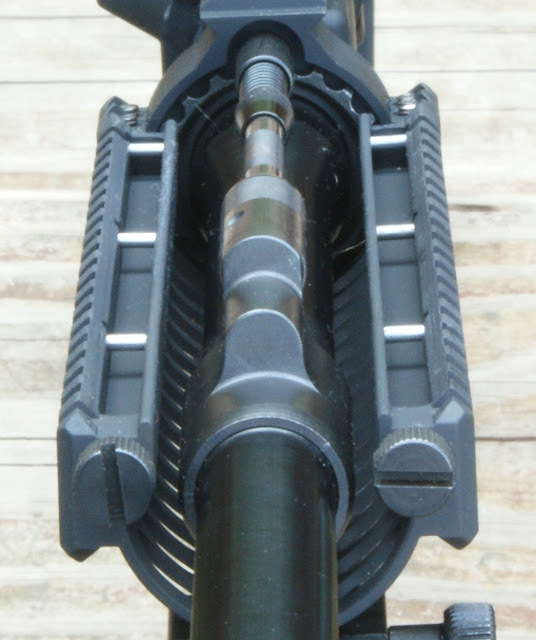 The charging handle and latch are shown below. Everything I have been able to find says that this handle is made from forged 7075 T6 aluminum alloy. One of the most recent upgrades to our rifles, the bolt carriers of all M6™ rifles are now coated with a proprietary nickel coating that nearly eliminates corrosion while providing greatly increased lubricity. This coating provides permanent lubrication to the moving parts. This nickel coating is similar to that being used by the US Army Research Lab and USSOCOM to extend the service life of their weapons systems. The best I can tell by reading several articles is that this coating is a good feature. My examination of the bolt carrier concluded that it is solid with no sharp edges as you can see in the photos below. A key feature is that the carrier has no gas key, but instead a solid integral anvil to receive the hit from the operating rod. Although the bolt carrier is not a standard AR part, I believe that the bolt head, extractor, extractor spring, extractor pin, ejector, ejector pin, ejector spring, gas rings, cam pin, firing pin, and cotter pin are standard AR parts. It would be very odd for a bolt carrier to go bad, but the other parts are the ones subject to wear and failure and replacement should not be an issue. The principal improvement comes from the incorporation of our patented self-regulating short-stroke gas-piston system. This system eliminates the venting of hot, carbon-laden gases into the receiver and bolt carrier group, thus eliminating the intensive cleaning regime of the legacy rifle. It also means the bolt carrier group and associated springs are not subjected to the searing heat of the tapped gasses, this being one of the major causes of small parts failure. This translates into carbines that are far more reliable than the legacy direct impingement carbines regardless of user maintenance. I was able to remove the components without much trouble and they were simple to re-install. To me it seemed like it will prove to be an extremely durable and reliable system. When the operating rod is in place, it can also act as a lock to prevent the barrel nut from loosening. When all parts are installed, the spring cup rests against the barrel nut. You can see the slight wear on the teeth of the barrel nut. During cleaning, I would inspect this area along with the operating rod to ensure that the barrel nut has not rotated against the operating rod. The operating rod passes through a steel guide bushing that is pressed into the upper receiver. I removed the rail covers to give a better view of the aluminum handguard. Just like the receivers, the handguard is 7075-T6 aluminum alloy and hardcoat anodized. The handguard is actually three main pieces. The lower piece is the largest and has the lower and side rails. The upper forward section has the majority of the upper rail. The upper back section is used to clamp the lower handguard to the barrel nut by the 4 Allen screws that are installed from the bottom. The total rail assembly measures about 9.5". You remove the upper forward piece by loosening the two thumb screws on the front of the handguard. Next you slide the upper portion forward and then pull up and it will come out of the lower handguard slot. When you remove the forward upper section, this exposes the gas-piston components. Also you can see below the three silver pins on each side. These are used to secure the upper piece in place. This upper piece is held firm with the two thumb screws. I would imagine that you will get a good return to near zero on any sight accessories that may be mounted on the upper rail. The rail covers that normally come on the rifle are (3) three Promag PM015 - Black Polymer 1913 Picatinny Rail (11) Rib Cover Panels. In the photo below, you can see that the side rail covers were replaced with ERGO 18-Slot Ladder LowPro Rail Covers. Personally I like the feel with the thinner ERGO covers on the sides. The barrel is a cold hammer forged 41V45 steel alloy and is NiCorr™ treated. LWRC states that "cold hammer forging takes an oversized barrel blank, and using high pressure rotary hammers, compacts the barrel blank over a mandrel which forms a perfect rifling devoid of toll marks." NiCorr is a low temperature nitro carburizing treatment (FNC) followed by an oxidation/impregnation phase. NiCorr imparts excellent wear resistance, increased yield and fatigue strength, lubricity, and corrosion resistance. The bottom line for the barrel is that LWRC states that they should last double that of a standard M4 barrel. You can see the barrel is stamped "5.56 NATO 1-7 CHF V NiCorr LWRC Intl" which is interpreted as 5.56 NATO caliber, 1 in 7 twist, Cold Hammer Forged, 41V45 steel, NiCorr™ treated, and manufactured (I think) by LWRC International. The sights installed on the rifle are manufactured by Troy Industries. I could not find the exact match for these sights at the Troy website. Since they are stamped with LWRC, I believe they are a special model. Regardless, they are quality sights and a good match for this rifle. The flash suppressor appears to be a standard A2 flash hider with a 1/2 - 28 thread. The buffer tube is a six position "mil-spec" tube, not "commercial". If you are not familiar, the best place to see the difference is at this comparison chart produced by Magpul. Knowing which tube you have will only matter if you plan to swap out your buttstock. I will be surprised if you do because the rifle comes with a quality buttstock. The buttstock is a VLTOR EMOD Buttstock. This product could be the feature of an entire review itself. Until then, I'm listing the key features from the manufacturers website. It has a very nice look and feel and repositions with ease on the buffer tube. Buttpad angle: -5 degrees with decrease to -15 at toe. Sling Attachments: Standard military and Quick Disconnect Swivel Socket accessible from both sides. Storage: Total of 8ea CR123, or 6ea AA batteries in storage tubes. Additional storage for 2ea AA batteries or small parts in quick access compartment. The grip that comes with the rifle is a Magpul MIAD™ AR15/M16 Grip. It has three replaceable back straps and two replaceable front straps. The base plug has a rubber insert that will allow the storage of 3 emergency rounds. The photo below shows the largest back strap and the single finger groove front strap installed. I like the larger grip and the finger groove gives me the added gripping security of the rifle not slipping when I hold it down at my side with one hand. The trigger that comes standard on the rifle is a single stage trigger that is between 5.5-9.0 lbs according to the owners manual. I measured the trigger pull on this rifle to be between 6.34 and 6.55 lbs. The trigger guard appears to be the Magpul Enhanced Trigger Guard™, Aluminum – AR15/M16. Based on what I have shown in this part of the review, this appears to be a quality rifle made from quality components and coatings. The only thing that surprised me was the mark made on the upper receiver by the bolt release. I really like the simplicity of the short-stroke gas-piston system and the fact that hot gasses are not going into the receiver area. Other parts of this review such as what's in the box and range testing can be found at my LWRC M6A2 Review Summary Page. Thank you for this review I am in the market for a good AR15 and this has confirmed a lot of my thoughts about the LWRC M6A2 in general and has also clarified a lot of my questions about the quality of the gun. I appreciate the photos you have posted. Any other insight would be very appreciated since I am still a month out from making the purchase. No new information on this rifle, but I'm trying to get a Ruger SR-556 to review. It is a similar piston rifle and I believe the street price will be less. Thanks for the thorough review. Very informative compared to many others. I was wondering if the rifle has an adjust for the piston like the Sig 556 has (and I think the Ruger has) in the event it gets "dirty". WOW!!! I'm In Love!! Can I trade my wife in for this? Thanks for your review!! I did a lot of research and LWRC seemed to always show up in the top 10 lists and keeps the AR platform for additional goodies!! I picked up my M6 A2 DEA model. It is like christmas all over again!! I did notice the upper an lower receiver being off a little. I measured .010" but my pins were tight. I shot a friends piston (transformed M&P 15 with CMMG piston) using 500 rounds of Wolf .223. I could not believe how clean the inside of the gun was. My M&P 15 looked like I poured powder into the reciever. I do not care what anybody thinks of the piston system--if you have not shot one, you are missing out!!!! Time to go shoot !!!! When did LWRC make changes to their M6A2. The previous models had carrier tilt and what did they do to prevent that? I found a used M6A2 for sale and I'm thinking about picking it up.